It measures 7 1/4 inches in length. There is no damage. Additional photos by email. I need your zip code to calculate the postage. 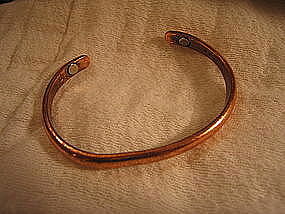 Vintage clamp style copper bracelet marked Sausalito Craftworks 4F. It has been worn and does show usage wear. I need your zip code to calculate the postage. 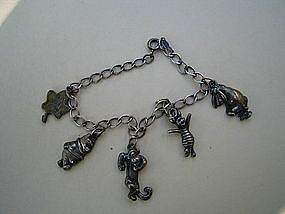 It is difficult to read what is stamped on all the charms, but the ones that I can read say Disney Sterling. 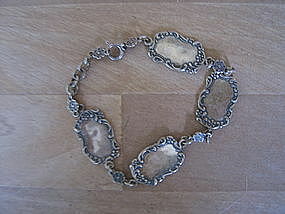 The bracelet is marked as Van Dell and what looks like S/S. It is 7 1/4 inches in length. There is no damage, but has been in daughter's jewelry box for several years and does show a bit of tarnish. I need your zip code to calculate the postage. 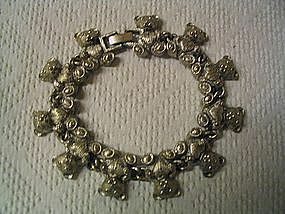 Stretch style bracelet marked as Avon. I don't think it would comfortably fit a wrist size other than small or medium. No damage. Additional photos or info by email. I need your zip code to calculate the postage. Dated 1994 and marked with "B" and 37463. 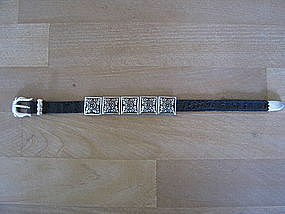 It is 9 1/4" in length, leather band is 1/3" in width and the 5 silver accents are 5/8" in width. Very little wear, but my daughter left it in a buckled position for 10 years and it has left an imprint in the leather. I have another Brighton marked leather and silver bracelet with a different design to the silver available for purchase and priced individually. Detailed photos by email. I need your zip code to calculate the postage. I am not sure if this is old enough to be considered vintage. 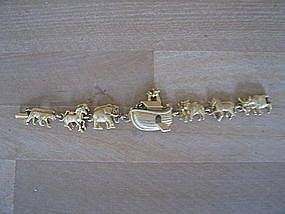 I bought it for my daughter at a resale shop a couple of years ago, so it is hard to give a date of manufacture. No maker's information or composition. It is quite heavy and substantial. Measures 7 1/2 inches. The only wear is to the fastener. Please email for additional photos. I need your zip code to calculate the postage. Hinged bangle bracelet in oval shape. 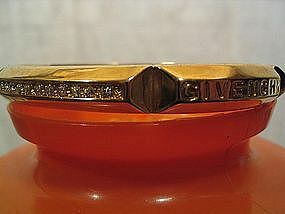 There are two sets of the crystals and 4 sets of the Givenchy logo on the bracelet. 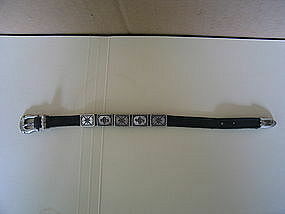 It measures 2 1/2 inches lengthwise (interior) and 2 1/4 inches (interior) widthwise. It is 1/4 inches in width. The clasp works well and is very secure. I will happy to provide additional photos. I need your zip code to calculate the postage. 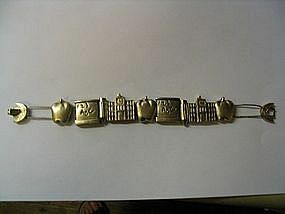 Substantial weight 7 1/2" slide bracelet in gold tone. No damage to this piece. I need your zip code to calculate the postage. Marked with Trifari and a crown. 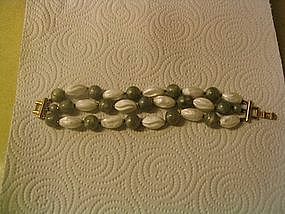 3 strand green and white beads. It measures approximately 7 1/2" in length and 1 1/4" in width. The plastic beads are separated by tiny gold tone spacers. Looks great in the spring and summer with white linen. There does not seem to be any problems with this bracelet. The clasp has a nice tight fit. 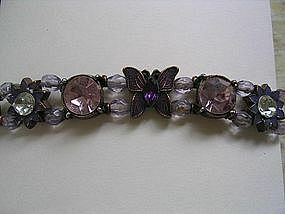 If you have any questions regarding this bracelet, please email. I need your zip code to calculate the postage.